The Title Company is usually ready for closing seven days after the receipt of contract. We can close early if all other parties (lender, buyers, sellers) are ready. 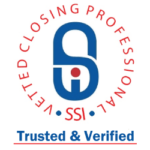 Generally, the only thing the Title Company needs at closing are the parties involved, their proof of ID and payment. Sometimes the lender may request the buyer bring additional information, or the Title Company or realtor may ask for additional information from the seller. The HUD-1 Settlement Statement is the form used to show how all money involved in the transaction is collected and distributed. Will my spouse need to be at the closing? Yes, unless this is your investment property. What does the Title Company need to fund the transaction? The Title Company needs three things to fund the transaction: signatures on all closing papers, all payment for the transaction, and authorization from the buyer’s mortgage company (commonly known as a funding number). Do you offer off-site closing? At Texas Secure Title Company, we understand that there are times when a traditional office closing may not be possible, and if you find yourself in such a situation, we are here to help. If you have a client that requires an off-site title closing, please give us a call or drop us an email and learn how we can help. Will my earnest money check be cashed? The State Board of Insurance, which regulates Title Companies, requires us to cash the earnest money check within three days of its receipt. When will I know how much money I will need to bring to closing? Within a few hours of receipt of the lender’s closing papers, the Title Company will prepare the HUD-1 Settlement Statement, which shows the final closing figure. Your lender will provide you with a good faith estimate prior to the HUD-1, so you will know approximately the funds you will need to bring to closing. All checks presented to the Title Company need to be payable to Texas Secure Title Company. Does the Title Company accept personal checks? We will accept a personal check for up to $500; anything over that will need to be in the form of either a cashier’s check or a wire transfer. If a seller’s temporary lease back is not involved, the keys are given upon closing and funding. If a lease back option was granted to the seller, the keys will be given to the buyer as outlined in the initial sales contract. When will I get my Deed? After closing and funding, the original Deed is e-filed with the County Clerk. The Deed will then be mailed to you within 24 hours of closing. When do I file for my Homestead Exemption? You must occupy the property on January 1 to file with the county for your Homestead Exemption. Most counties will send you an application form. If you don’t receive this form, call your county’s appraisal district to request it. Can I use my old survey? Our Title Company will accept an existing survey of any age as long as no changes have been made to the property. Do I need to give my original Deed to the Title Company? No; the Title Company pulls directly from the County all Deed records on your property. Do I need to order a payoff statement from my mortgage company? In your thank you packet from the Title Company is a seller pre-closing information form. On this form, you will provide us with information about your lender and we will order the payoff statement for you. When will I know how much money I will receive at closing? Our Title Company standard is to provide your agent a preliminary HUD-1 five business days before closing. This will have the estimated amount you will receive at closing. The final HUD-1 will be prepared upon receipt of the buyer’s Mortgage Company closing papers. Upon closing and funding, the Title Company cuts all checks to all parties involved in the transaction. Do I need to bring all my keys and garage door openers to closing? Not typically. Please discuss with your agent how the key transfer will take place.